Equistro Mega Base Junior for Horses is a specifically designed mineral and vitamin supplement for foals that has been fortified with copper. This highly nutritional supplement has been developed especially to suit the high requirements of a weaning foal. 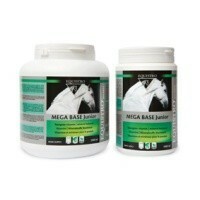 Fortified with copper and other trace elements with a high biological value, this Mega Base Junior is optimal for skeletal development and supplementation for the foal from 4 weeks and beyond. Recommended administration for foal baseline maintenance is 20-40ml 2 to 3 times per week, a light sized foal is half of this.